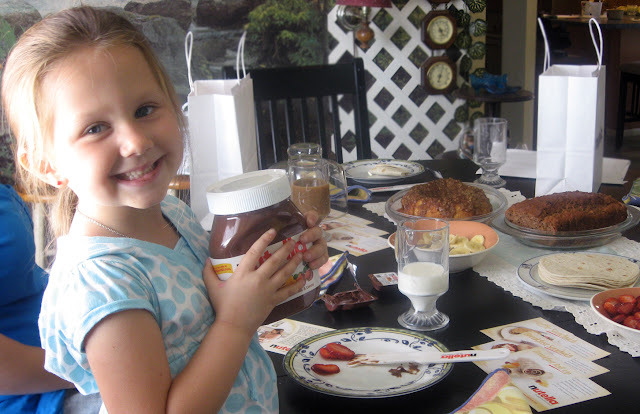 Being a longstanding fan of Nutella I naturally jumped at the opportunity to host a Mommy Party. When the party package arrived, I was even more impressed. In addition to a 25-ounce jar of Nutella, the box included enough beautiful Nutella tumbler mugs, Nutella spreaders, $1.00 coupons, sample packs, gift bags, recipe tip and idea cards for ten guests! What’s more, a Nutella breakfast tips and trivia activity was in there too. After clearing a date with my friends and family, which can oftentimes be a daunting feat by itself, the Nutella Brainstorming began. Easy, wholesome, and deliciously sweet were my Nutella Breakfast keywords. Spread about 2-3 TBS of Nutella on a Flour Tortilla. Add sliced bananas, sliced fresh strawberries and start rolling. This one is so easy the kids can prepare their own using those cool Nutella spreaders. My great niece not only enjoyed making the wraps but also had fun spreading Nutella on those fresh strawberry slices, yummy! The Monkey Bread recipe was relatively new to me; I prepared it only once, and without Nutella. For that reason, I prepared one in advance with the Nutella filling and hubby agreed to be the guinea pig! Hubby and I concurred while the bread was good, with the Nutella filling it needed to cook 5 minutes more. 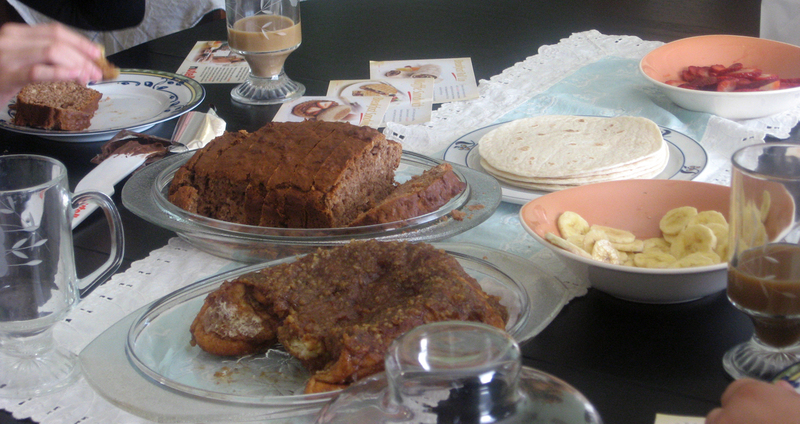 Not that the Monkey Bread was raw in the center it simply was not as light and airy as it should have been. For the party, I decided to go with extra nuts and a Nutella glaze. Below are directions for both methods. Remove dough from freezer and thaw in refrigerator. Melt butter in medium size bowl. Mix brown sugar and cinnamon in separate bowl. Tear off enough dough to roll into balls just smaller than a golf ball. Add a dab of Nutella on the tip of the dough piece and roll or wrap the dough into a ball surrounding the Nutella. Roll the balls into the butter bowl, allowing excess to drain. Then roll in the cinnamon-sugar bowl and place in your choice of pan; loaf, cake, or bundt style. A tube pan is not recommended, they leak. Pour remaining butter and cinnamon-sugar mixture over prepared dough balls and mix. Let rise until doubled (about 30 minutes in a warm place). Bake at 350 degrees F for 20-25 minutes. Nutella filled dough will require 5 additional minutes. Let cool for approximately 2 minutes and invert onto plate. If desired, while bread is cooling prepare glaze. To a small bowl, add the confectioner’s sugar and milk; whisk together to combine. Add Nutella and continue whisking until smooth and creamy. Somehow, I added a bit too much butter and the center of the bread fell. I made this Monkey Bread three times in one week and NEVER did it fall! Obviously it would not hold a glaze **sigh, head shake, sigh again** Perhaps baking at 1:00am had something to do with the falling, another sigh. I almost didn't serve it but hey my guests were family and close friends. Nutella would have to be spread on. Turns out that concept worked just fine because this one was a sweet bread. As I write there is not a morsel left tonight. It didn't look so pretty but it tasted mighty fine! The oatmeal bread was delicious with a swipe of Nutella and coffee or milk to dunk. This bread was originally an oatmeal muffin recipe. It contains very little sugar and old fashioned oat. Of course I added some Nutella to the batter. 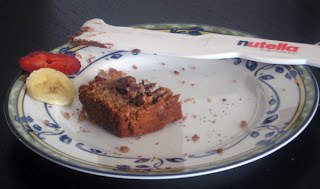 I will be sharing the Oatmeal Nutella Bread recipe as part of my baking mix recipe ideas next week so stay tuned. Mommy Parties is a powerful in home, word of mouth social media strategy, a division of BSM Media. They give moms everything they need to host a brand themed, in-home party with other moms who are eager to learn about products. Moms interested in hosting parties find more information at MomSelect.com. My great niece was the star and just adored being part of the Mommy party. We had a great time and lots of Nutella! Thanks to Mommy Parties for affording me the supplies necessary to host a fun, delicious, and very successful party.